Gonna keep this fairly brief, because a better festival looms, the details of these movies are falling out of the back of my brain, and, not to put too fine a point on it, we're kind of in "if you can't say anything nice…" territory. 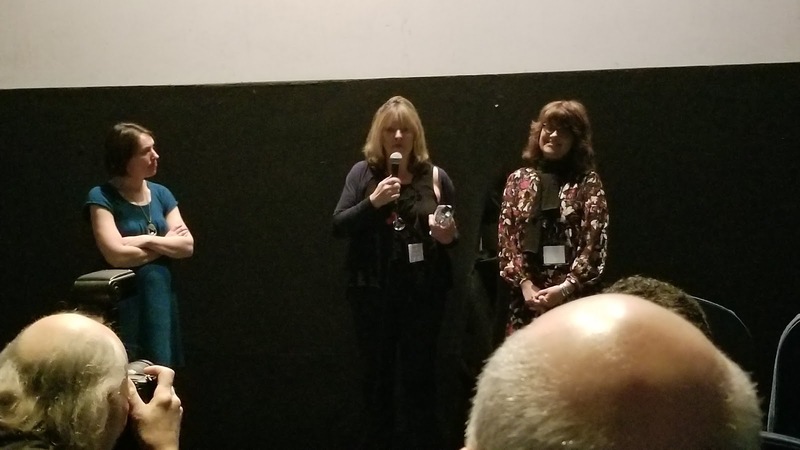 So let's get past WBUR's Erin Trahan (left) presenting Division 19 filmmaker S.A. Halewood (center) with the festival's "Best Direction" award quickly. It would be the sort of thing that makes me grumble about festivals which give out awards based on attendance rather than merit even if we hadn't seen really good direction from Kiyoshi Kurosawa the previous night. But, I suppose, if you presume that Before We Vanish was screening "out of competition" because it was likely something where the festival contacted a distributor rather than a submission, there's a bit more of an argument., albeit one that kind of involves getting the most she could out of her own script. Regardless what I thought about that, Halewood and producer Christina Varotsis (right) gave a pretty good Q&A, one that was especially interesting for how much it talked about the importance of a good producer in finding and securing locations (this one was shot mostly in Detroit) and getting all of the details in place so that the director can shoot her film and put it together. It being women-in-film night, they talked a bit about the obstacles in an industry that is, in many ways, quite male-dominated. The second film of the night was Pardoxical, billed as a "rare science fiction film from Taiwan", which I guess is true, although I wonder a bit about that rarity; Didi's Dream just came out last year, and while it's not necessarily really sci-fi, it seems to presume there's enough of the genre being produced in Taiwan to make its backstage romance work. I initially thought that Taiwan also gave us Love in Space, but that is apparently not their fault at all. The next night was "Sci-Fright Friday", and… oof. I already knew I was going to cut out after one movie because I saw the trailer for House Shark and I've got strict rules against watching things that are actively trying to be terrible, but I expected a bit more from Framed, only to find it pretty awful, a dumb and gross horror movie that could have done a lot more with its premise but is, instead, simply nasty. The upside is that it created a hole in the schedule where I could get downtown and start on the Chinese New Year movies, but that's just good for me, not the event. Filmmaker S.A. Halewood has a set of interesting ideas, mashing up prison labor, unscripted television, surveillance, etc., but she never really finds much of a story to go with it. She and her collaborators do okay in creating atmosphere and executing their world-building, but good luck remembering a single thing that actually happens. There's the vague shape of a desire to expand one program to somehow control the population more, a jailbreak, and a brother, but none of it ever grabs the audience as an immediately interesting situation, just one with the potential to intrigue if it's developed the right way - something the film never gets around to. Maybe if the audience was drawn in by escaped prisoner Hardin Jones, it would be different. It's important to have an interesting main character under the best of circumstances, but if the story is built around him being an ultra-popular potential messiah, you really need him to be something more than the complete non-entity that is expected to carry this movie. There is no reason to be interested in this guy at all - heck, half the time his memories are suppressed, so there is really nothing to him - and as a result, the audience never gets any sort of hook into his world. Satirically, the film seems to be about twenty years behind the times, playing off outdated notions of popularity and prison politics, built around the sort of pre-internet thinking where one thing available on one of the limited number of outlets dominates the conversation, not today's fractured media landscape. It also seems ridiculously tiny, like the massive oppressive government consists of five people in one nondescript bit of office space The film does use its digital effects budget well, creating a future dystopia that looks pretty good, but it never manages to fill that world with compelling characters or stories. There are a lot of the same names repeated in the credits for Paradoxical, and a fairly young cast, so take it for what it is - an ambitious bit of DIY filmmaking that at times seems like it could really benefit from tightening its story up, pulling its two halves together, and, yes, maybe having a little money for effects so that you can show something fantastic happening rather than talking around it. It's not a bad example of that sort of movie, just one where a little experience might give filmmaker Tsai Mu-ming a bit more of a handle on when to let things play out slowly and when to go for efficiency. The two halves of the movie aren't bad ideas - one side has the interesting concept of a think tank being hired by the government to replicate how a group used a time machine to commit financial crimes so that law enforcement can counter it, with Yuan-hai (He Yu-chen) and Yo-Kuong (Yen Yu-lin) given the job, while Yo-Kuong winds up taking a terrarium class taught by Shi-jing (Helena Hsu), whose family lost everything due to the scam being investigated, and falling for her. It certainly doesn't hurt that the young cast is very appealing, and though Tsai keeps it low-key, there's something inherently thrilling to a company that specializes in testing the future, and the contrast of how Shi-jing has found a simple, laid-back, seemingly natural contrast is solid. Doubly so when you figure that those terraria are very much artificial order rather than a true escape from the complex mathematics of modernity. The biggest problem is that there's really not a whole lot to do with the time travel for much of the movie, with it (and Yuan-hai) relegated to occasional but drawn-out check-ins while Yo-kuong and Shi-jing meet and get closer, and it drags, with a long one-year-ago flashback to little apparent end. Tsai has some fun once the short trip back starts, although her characters are kind of keen on explaining things repeated until the very end, when the big finish kind of fizzles. It's a nifty idea for a no-effects time travel story, just one that has a bit of a hard time zeroing in on the most intriguing material at times. I'm sure that Framed is far from the first film to combine home-invasion and live-streaming, but even if it was, it seems obligated to try a little harder than this. It's got blood and guts aplenty for those not interested in much more, but that appears to be about as far as its makers got in planning it out. There are a dozen ways they could have made this movie interesting, even if the villains were just going to be random avatars of chaos, and the makers chose none of them. For instance, it's mentioned that all (but one) of the potential victims earn money online in some way, but there are no specifics, and therefore no irony to be had. The kills are nasty, but often ridiculous; two different drugs are used to force people to do horrible things, and it just feels lazy, like the writers don't want to take the time to properly break their victims, but can't even bother with more than hand-waving. The bulk of the film is set in a single house, but the audience never gets any idea if its layout and where everyone is in relation to each other. The cast is capable enough with what little they have, and the gooey effects are suitably gross. But there's nothing here other than the most done-to-death "people will watch anything" cliches, not even horrifying nihilism or self-satire. If all one cares about is the ugly outer surface of a horror movie, maybe doing that with basic competence is enough, but that's an awful low bar to clear, especially after hints of greater ambition.